Deep in the Northwoods of Wisconsin a group of pissed off bluegrass pickers decided they wanted to change bluegrass for all mankind. They failed to do so. Now, they just continue their barnstorm of the Mid-West in hopes of one day to play a song so fast, that it actually disrupts the space-time-continuum. 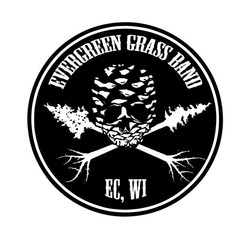 The EverGreen Grass Band was formed in 2008 over the course of many beer & whiskey fueled nights hosting the open mic at the Mousetrap Tavern in Eau Claire, WI. The 4-piece, including guitar, bass, banjo, & mandolin have been playing their distinctive and aggressive blend of bluegrass, punk, rock n’ roll, jam & country with various members consistently around the Midwest for 5 years.